Greetings from our Floral Department. This elegant arrangement is made with white roses and dusty miller in a simple pedestal container. As you can see in the video, first our floral designer puts floral foam in the container and uses floral tape keep it in place. Floral foam, or Oasis, is soaked in water and allows us to create unique arrangements in vases that can’t easily store water. Next, the designer adds greenery. 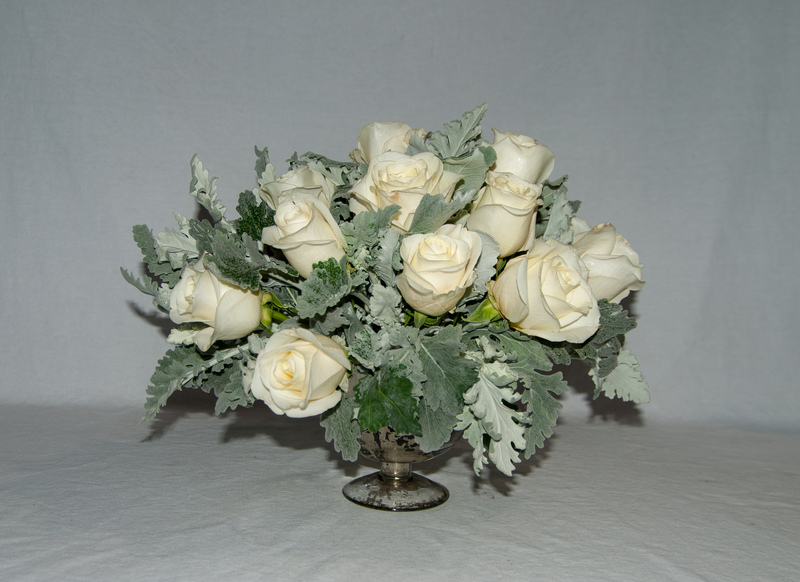 In this case, we are using dusty miller as our greenery base for the arrangement. Dusty miller is an elegant, ruffled greenery that adds another layer of sophistication to the design. After there is a base of greenery, we begin to add in the white roses. The roses serve as the focal point of the arrangement and fill out the space. See the beautiful finished product below. This arrangement was made for a photoshoot for one of our new clients, Pursell Farms.